DLP Self Portrait Tutorial and Giveaway! Congratulations Andrea Harris and Karen D.!!! You are one of the winners of a copy of my new book! Please email me at pamcarriker@gmail.com with your mailing info and I’ll send out your book! So excited to be asked to do this weeks journal prompt for The Documented Life Project. They nailed my interest spot on and I am excited to share one of my favorite techniques for creating self portraits in my journals. I’ve added some ways to transfer guidelines and details for those new to drawing faces and much more information is included in my new book for those interested in taking portraits even further. Be sure to see the BOOK GIVEAWAY info at the bottom of this post! 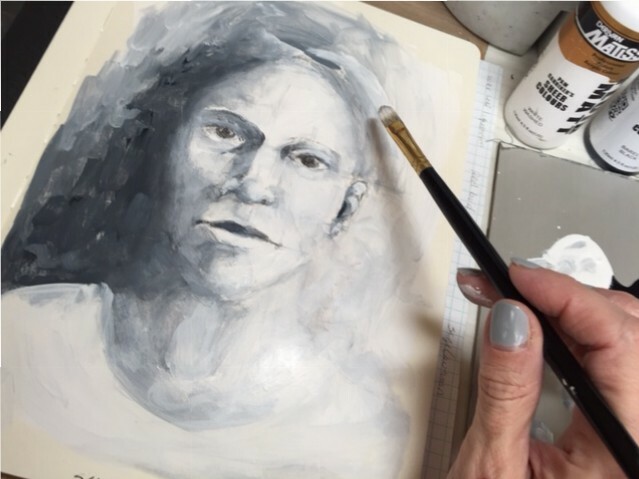 I’m using one of the mini tutorials from my book, Mixed Media Portraits with Pam Carriker for the inspiration to create a mixed media ‘selfie’ in my art journal. I think it’s fun to incorporate faces into journaling and one of the things I talk about in my book and workshops is about the importance of adding a bit of yourself to your faces. A self portrait doesn’t have to look just like you to be a self portrait! Most of my portraits don’t look just like me but, if you look closely at my faces most of them have a bit of a bump on their noses. This is one of the ways I like to add a bit of myself to my work. The bump on my nose bothered me a lot when I was a teenager but its something I’ve come to embrace as an artist. You can often find self love through your art and especially when doing portraits you can learn to love the things about your face that make it different from everyone else’s. I encourage you to embrace your face in this exercise! And it is just that, an exercise, let go of trying to make a pretty face and instead focus on creating an interesting face. 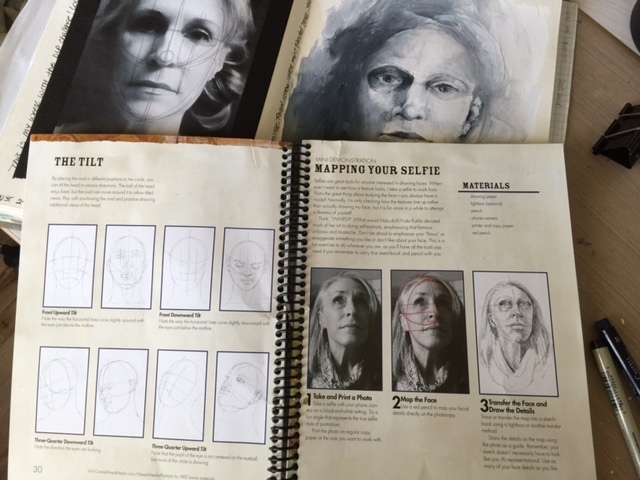 The ‘Mapping Your Selfie’ demo in my book is on page 31 (My book doesn’t come spiral bound, I had that done at Staples for under $5) We are going to be working in Shades of Gray or a Grisaille painting style. In this way we can learn about tonal values, lights and darks as well as facial proportions. This comes in very handy when you add color into the mix and is an important foundation for painting faces. Prep page with a ‘skim coat’ of gesso, scraping most of it back off. Let dry. Use a 6B (soft lead) pencil to draw a Face Map on top of the copy of your selfie. You can find complete instructions on mapping a face in my book Mixed Media Portraits with Pam Carriker but for this exercise you will want to draw a circle to represent the head mass (this will begin at the top of the head and end below the nose) Then add an oval to represent the basic plane of the face (this will go from the top of the head to the chin) next add a horizontal midline, vertical lines where the eyes, bottom of nose, and mouth midline are and vertical lines from pupil to the corner of the mouth. I added a circle where the ball of the nose is and you can add a few lines to the mouth and eyes if you like. 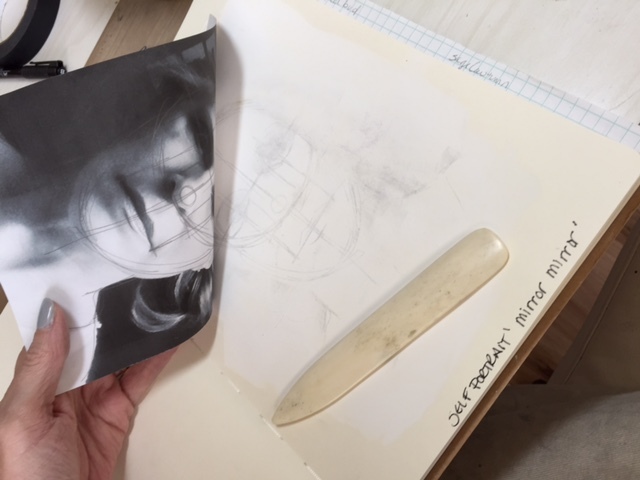 Next flip your face map over onto your journal page and burnish the back with a bone folder tool to transfer the graphite lines. Tape the face map to the left page of your journal to use as a reference. Use the 6B pencil to roughly sketch in some details and add graphic to shaded areas, using the lighting in the photo to guide you. Don’t get overly caught up in making things perfect. This is a rough sketch to lay down some graphite. Put some white and black paint (I’m using my line of Fluid Matt Sheer Acrylics in White Washed and Barely Black) onto a palette. NOTE: my paints are very fluid and have a bit of an extended dry time so depending on what paints you use your results will vary. If you are using a more heavy bodied acrylic paint, add some water and some glazing medium to it. Using only white add some paint to the areas that are the lightest in your photograph. 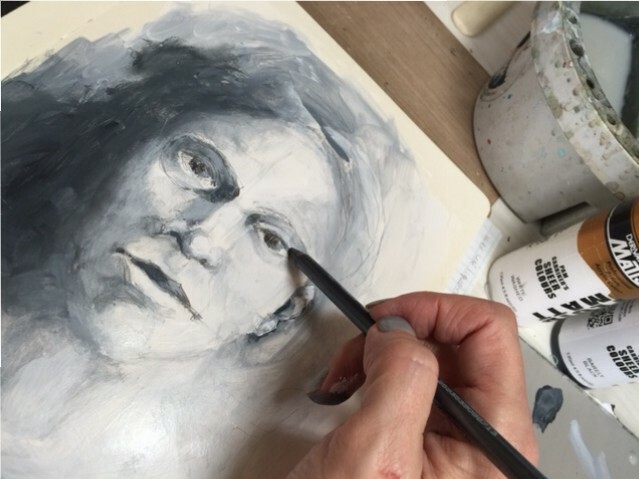 Being to blend the white paint into the graphite on the lightest side of the face creating tones or shades of gray. 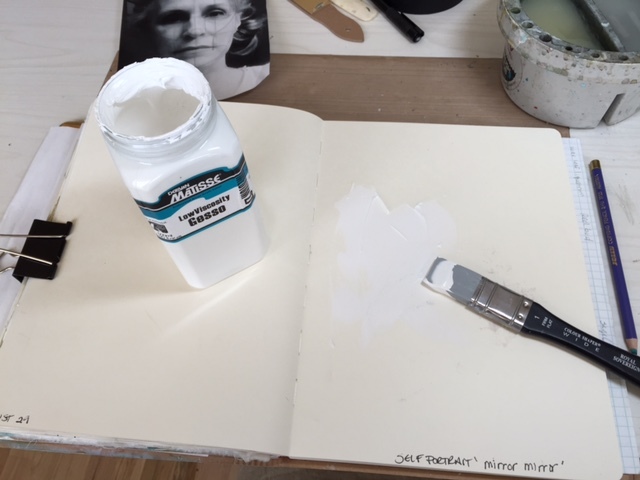 The graphite will easily mix with the white paint because it is laying on top of the gesso. 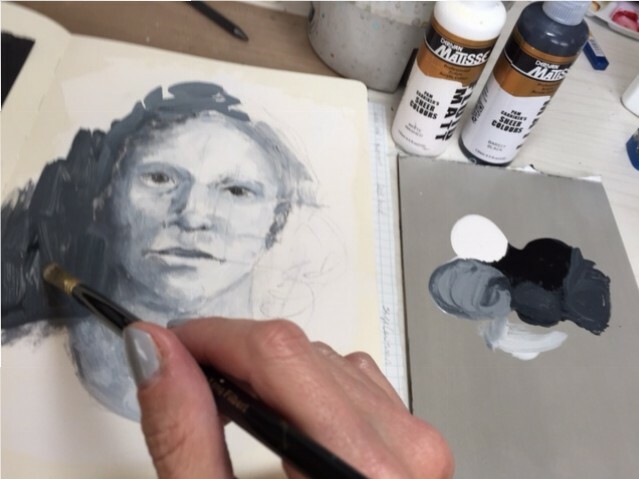 Continue blending white paint into the darker side of the face, mix it right into the graphite and rinsing your brush as needed to keep from making everything the same value or shade of gray. Add a bit of black to the white on the palette and add even more tones, or shades of gray to the portrait, extending into the background around the face. Pay more attention to the ‘areas’ of tones than to a line around the face shape, use the photo for a reference. Add white paint into the black areas in the background and blend. You can add bits of white to create hair as well. Use pencil as needed to define face details a bit. When finished painting you can add journaling notes (I noted the process and supplies used) to the lefthand page. This is a fast way to create a self portrait in your journal. Remember it doesn’t have to look like you to be a self portrait, whatever it looks like it will have some of you shining through! 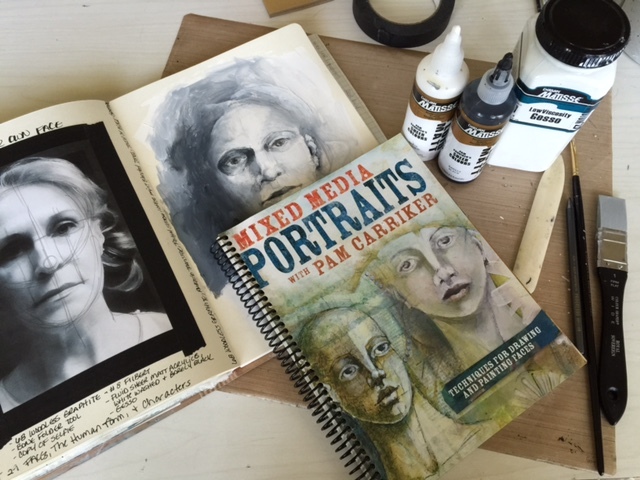 AND TO CELEBRATE CREATING PORTRAITS I’LL BE DRAWING TWO NAMES FROM THE COMMENTS LEFT ON THIS POST TO WIN A SIGNED COPY OF MY NEW BOOK, MIXED MEDIA PORTRAITS WITH PAM CARRIKER!!! I’ve been terrify of doing portraits and specially my self portrait, the hardest part is to get the soul of the person. But after these tutorials I feel like trying and I love the part when you say “your journal is the space where you can experiment without the fear …” Thanks!!! Pam, You make this look so easy!! I have been putting off this challenge, because I am scared of doing it!! thanks for the great tutorial!! Wow, that is pretty cool how you’ve done that. As always Pam, thanks for the inspiration. Would love a copy of the new book. I love the idea of using a selfie and a map as a start point. Thank you for the hint! Love all your tricks for doing a self-portrait! ?Will try it out asap! Your tutorial has inspired me to try drawing faces–something I have always shied away from–Thank you !!!!! Congratulations Andrea!!! You are one of the winners of a copy of my new book! Please email me at pamcarriker@gmail.com with your mailing info and I’ll send out your book! I loved the tutorial, thanks! I am looking forward to seeing your book, I hope I win! Such a generous giveaway — and post — Pam. Thanks! Excellent tutorial! I’m looking forward to giving it a try. Thanks! You always make everything seem so easy. I am going to give it a shot. Thanks for such great step by steps! Thanks so much for sharing the videos…great tutorials! Very cool. Thanks for the tutorial and the chance to win your book. This was truly amazing!! Thanks so very much for agreeing to be a part of The Documented Life Project! Your step-by-step and video directions make me feel confident that I can do this as well. What a joy to have you as our Featured Artist and I just know that you have inspired so many. I will definitely be getting your book! Again, thanks so very much!! Beautiful! Very exciting giveaway! I really enjoyed seeing the dark/shaded part of the eye in the self portrait. Comparing the two pictures section by section was fun to do for me. I know that sounds strange but I enjoyed looking from picture to picture and comparing the shades and areas of shading and darkening. I have tried drawing a self portrait from a mirror. This graphite transfer method is a lot smarter. When i started doing art (after always insisting that i couldnt draw anything), i then said that i would never be able to draw faces. Love breaking down all my resistance! Loved the tutorial. Can’t wait to give it a try. You’ve given me courage to do this. Great instruction. I need to get practicing and see what happens. You make it look so easy but I know you have put in the time to perfect your art. It is beautiful. Hello! This is right up my art alley! I am practicing painting people and portraits this summer to try and get better at it. LOVE the tutorial and THANKS for the offer. Wow – such a helpful process – I would LOVE to win your book. Creating faces is one of my growth goals that I’m focusing on. Thanks for the giveaway! Thank you for the great tutorial. I would love to win a copy of your book! This looks like a fabulous tutorial. Can’t wait to try it! Yikes! Self Portrait. This is pressing me way outside my comfort zone. Thank you for this tutorial and sharing it with all of us at DLP. Great, very interesting and precious! Thank you so much! Thanks so much for this detailed tutorial! I have never done a self portrait but I am going to try it for the first time! A little nervous, but also excited. Thanks again! Thanks so much for this detailed tutorial. I have never done a self portrait but I am going to try it for the first time! A little nervous, but also excited! Thanks again. What a wonderful treat and welcomed surprise to get a mini-class/tutorial from you on DLP. I have one of your books and DVD I reference often. Thanks for making something challenging, to me, as drawing faces more relaxing. Love what you do. Thank you SO much for the details Pam. I can use all this to return to as I practice! Much appreciated. Ps will try to track down your paints as the colours look amazingly rich and deep. Thanks so much for the tutorial. Always love your comprehensive teaching style…and would love a copy of the new book! Pam, love how this is broken down. Your book is amazing and very helpful. I have started a “Drink & Draw” group at our local coffee shop because of YOU. A signed copy of your book would be an awesome “give-a-way” gift to someone in my coffee shop group. Will be trying this technique soon. Thanks again. I love your work and how you have simpified it into a tutorial for all to use. I can’t wait to get started. 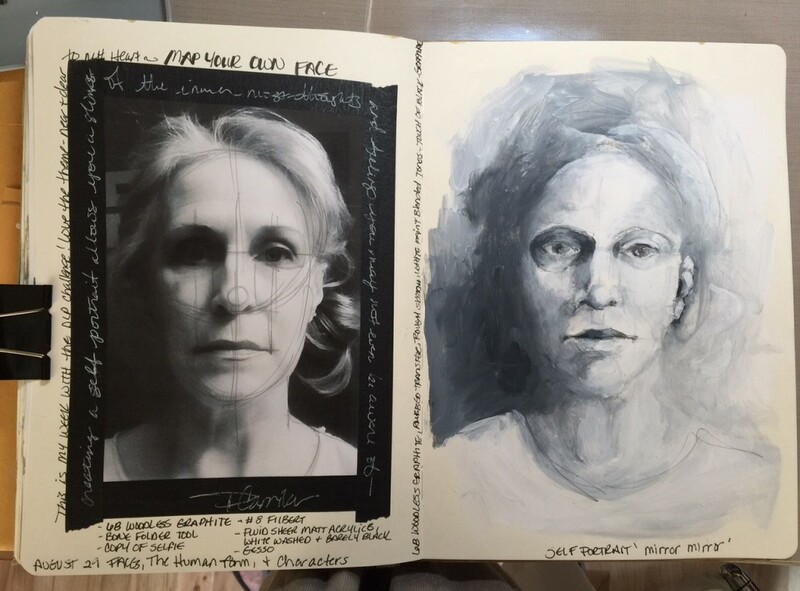 Hi Pam: I bought your book when it came out at Amazon and I really appreciate all the suggestions you give to experiment and try different techniques for drawing and painting faces. Truly inspiring and very helpful for someone like myself just discovering mixed media. Your tutorials are an added bonus. Thank you! This is fabulous! Thanks so much for sharing your expertise and your talents! Really enjoyed your tutorial and will definitely give this a try. Thank you for sharing! Thanks so much for making this tutorial, it’s fantastic!! I’m so excited to try face mapping! Thank you for the tutorial. I so love your work. You are an amazing teacher. Thank you so much for this video, it is always great to see other at work and we get very few live workshops in my part of the world! Love your work, it has been greatly inspirational to me. Love it, thanks for the generous offer. Thanks for the tutorial, I loved the way that you transferred the graphite lines from the photo to the journal page to make the process easier. I am not very confident with my drawing, so I think that a few guidelines would provide a good guide to a better result. Congratulations Karen!!! You are one of the winners of a copy of my new book! Please email me at pamcarriker@gmail.com with your mailing info and I’ll send out your book! What an interesting process, Pam! I’ve never done a self Portia, but after watching your video, I think I’m going to try it. Thanks for the chance! I spotted the packaging immediately and wondered what products you were using. They look great! Thanks for sharing this lesson with us. Amazing! What a nice opportunity to learn to draw and paint faces! Thank you. My friend just bought your new book and is raving about it! I got the new “faces” magazine and am learning as much as I can from the wonderful tutorials included; including yours or course! Wow, this is just amazing! Great work. I started with you when I decided it was time to try portraits, and I keep coming back to you for more guidance. So glad you were the guest this week and thank you for the chance to win you book. Loved the videos. I haven’t done a SP since high school. I think I could done now after reading your demo. Thanks for the tips they have given me the courage to try one now and I’m 67. Boy will it be shocking to see them side by side if I can find the journal in which the 16 yr old me was done. Great tutorial! Would love to have a copy of your new book. I am looking forward to playing with your portrait ideas! Thank you for your giveaways! Of course, I hope I win a copy of your book! You make it look doable! I will try this. Thanks for the guidelines. 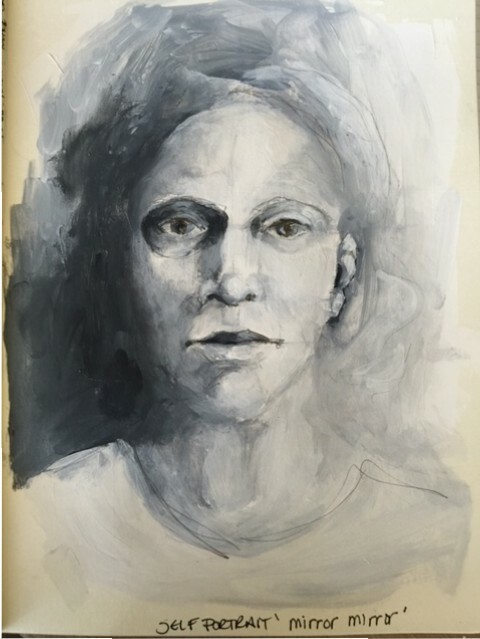 What a great tutorial and instruction on painting a self portrait! How wonderful it would be to have your book as a resource. Thank you for sharing your talent. Wow, I have been kind of stagnant and not able to enjoy any time in my art room. When my emotions get the best of me, I avoid creating. After watching this video, I went straight in to give it a go. I used this technique and I am thrilled with how they turned out. I am so very grateful for your teaching. It was just what I needed at just the right time! Thank you immensely! I love your work. Thanks for sharing your talent! Awesome technique and tutorial! Thank You! Thank you for taking the time to be so detailed. I’m looking forward to trying this! I am definitely going to try your technique. It’s the most interesting I’ve ever seen and you make it look so doable! Thank you for the very informative video. I learned a lot and want to try it. Would love to win a copy of your book. So glad to see you do a tutorial of a self portrait in the DLP. I am new to this group this year, but I’m not new to you. I also started with your first two books (well at least the first two that I saw of yours…on journaling and also have your portrait book already. I love it and whoever wins this give-a-way will be very lucky to receive it. I think you have a great style of teaching and I also get so much from your books and videos!! Thank you for doing all that you do!! Love your tutorial. I can’t wait to try mixing the white with graphite. The face mapping makes so much sense. I really really could use your book. Im going to cross my fingers and toes. I love your work! I’m so glad to see you as a DLP guest artist! Thanks for the insightful and informative video and tutorial. Enjoyed the videos and am interested in learning more. I love interesting faces, faces with sharp planes and contrast. I’d love to win a copy of the book. Thank you for this detailed & helpful tutorial. Thank you too for the opportunity to win a copy of your book. What a great technique, I’ll certainly be giving it a go. Thanks for the easy to follow instructions/video. Pam, thank you for this awesome tutorial. Faces intimidate me, but I love how everyone shares their talents and techniques so generously here!! I am definitely a visual learner, so this is a huge help! Thank you again! Wow!! I’m going to get started straight away! I’ve never been very good at portraits but you make it look so easy! I also cant believe how easy it is to open my computer and immediately receive instruction from someone as talented as you, from the other side of the world! (Australia) What a wonderful world we live in!! Im so happy you are a featured artist on DLP! 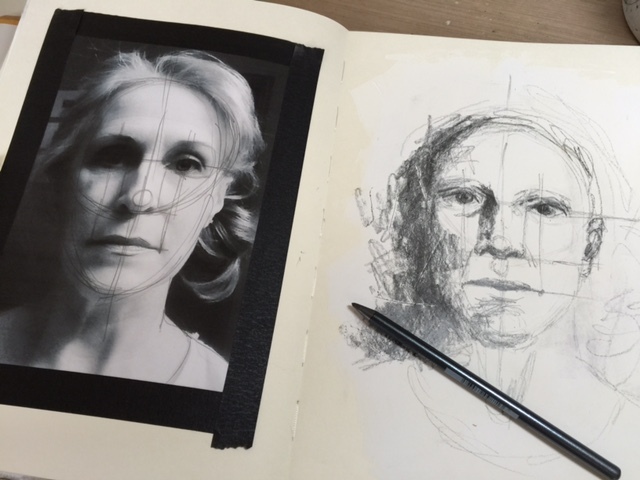 I’ve admired your work for so long, but drawing faces just hasn’t appealed to me – BUT – following your technique, I’m going to give it a try! I know it is never as easy as you make it look – thank you for giveaway too, Pam – so sweet of you! What an amazing technique for helping people draw faces. As soon as my 2 year old grandson goes home I’m going to study this in a lot more detail. Thanks Pam. Thank you for the tutorial! I am anxious to get to my art table and give it a try. Thank you so much. You make it look easy but more importantly it should be fun. Thanks. I love the book and all your art. I have my book and I am working in my sketch book right here on vacation. So thank you for all your hard work. Anything from you is brilliant! Love the tutorial. Thank you for making me feel like I can do this! Pam, you make faces so accessible! Absolutely love this technique. Love your portraits. The other day I was going through the details of your book on amazon. I really would love to have one. Thanks Pam for sharing your awesome tutorials; you make it look so easy. When are you coming to Fla to teach? Oh how I love to watch you do your style of drawing and painting. I always learn something from it. Thank you for being with us this year and sharing from your archives of experience. Your details, and instructions are easily understood, and very appreciated by me a total neophyte, thank you Pam? Pam thank you so much for being our Featured Artist this week – you are so generous with sharing your amazing talent and I know our Members will love the giveaways! 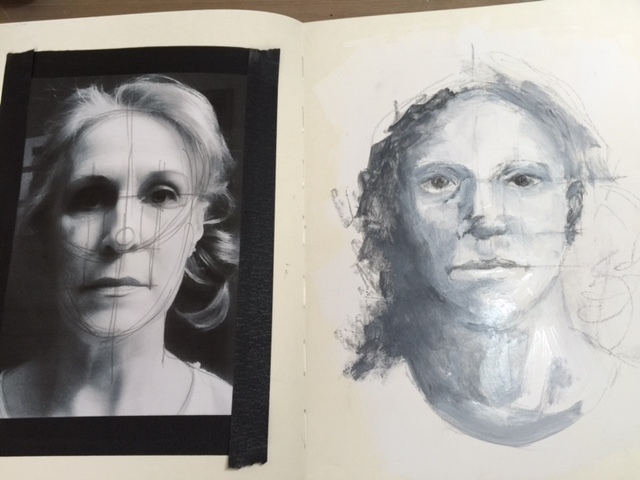 I have my moleskine, white paint, graphite and filbert in front of me at this very moment to give it a try – THANK YOU! Thank you for the tutorial. It’s wonderful to watch you in real time, while you are explaining your process. Thank you, too, for the chance to win your book! Pam- Thank you so much for being a Featured Artist this week! What an informative and education post you created for us. It is so appreciated. I have learned so much about values this month and was happy to see that you are continuing the lessons. Thank you again!! You have a signature style and it was wonderful to watch you work! 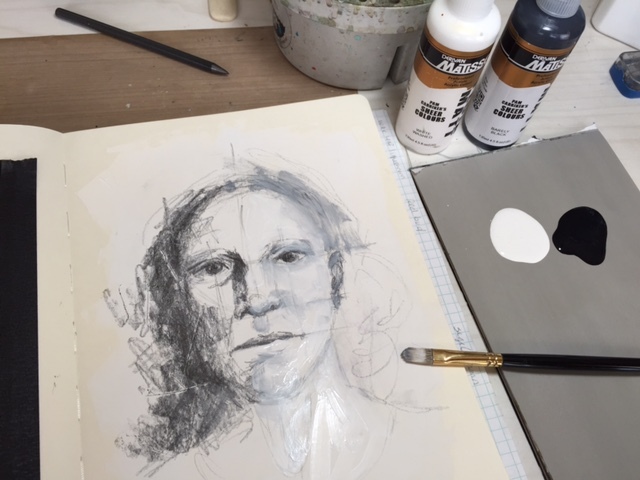 Haven’t tried this technique…I’ve always used black and white paint before… so now I have to get busy! thanks for the opportunity to be entered for your give away! Never been very interested in portraits, but after seeing your selfie tutorial I am going to give it a try! Great technique. Thank you, this looks like fun, I’ll have to try it. COOL method…thanks for sharing your talents! Thank you Pam! I have always had trouble drawing faces. Can’t wait to try you method! Wonderful tutorial. You are a gifted artist and great teacher. Thank you. Wonderful tutorials! You make it look so easy, thanks for sharing your talent with us Pam. I was soooooooooo excited to see you on here today!!! I’ve just discovered you, and I’m hooked!!! Thanks for sharing this tutorial! You make it look so easy!! (One of the hardest things to draw are “faces” for me, so I ‘ll definitely try this). i am looking forward to trying this over the weekend! thank you! I am so excited to try this method of drawing/painting! I love your video, watching you create as you explained everything. I would love to own your book.Thank you for sharing and being the featured guest on DLP. Great info here! Can’t wait to get your book! I’ve loved your classes and your blog! Thanks Pam! What a wonderfully detailed tutorial and a very generous gift! Loved your tutorial. Your fluid paints look awesome! I like the idea that they dry with a matte finish. I have to try them out! I am so thrilled you were able to join us as a Featured Artist this year Pam! Your work is truly amazing and it was so lovely to follow along with your process. You were truly generous in your sharing with us. Thank you so much ! Lovely, thanks for these instructions and demo. Thank You for sharing your talent in this lesson. Excited to try the technique! I love your teaching style and this tutorial is great. Faces are something I want to tackle and you make it look very doable. Thanks for the reminder that we don’t need to achieve perfection. Oh my, I must try this!! Maybe I can finally get a picture for facebook that I like! Thank you for the tutorial!!!! Fascinating tutorial. Thank you. I will give it a try. I love painting and drawing faces! Good that it doesn’t have to look like the person you’re drawing, because it never would. Love the face mapping idea. I love watching the ease with which you work your magic. Thank you for sharing! 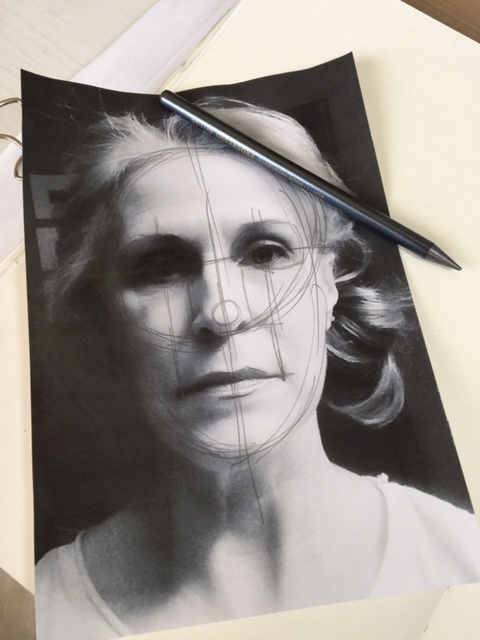 Thanks for your super lesson Pam , I can’t wait to try your technique of mapping the face ! Hi Pam: love this post !!! have your “Creating Art at the Speed of Life” and lovelovelove it !!! I made my own journal for it and have really enjoyed working thru the book – slowly but enjoying every bit of it : ) I’m currently taking a “drawing” class at our community college and truly having a great time. I’ve had your new “Portraits” book in my cart for a while but would be thrilled to win a copy : ) thank you for the opportunity !!!!! Pam I have learned so much from this tutorial…face mapping looks easier and can’t wit to try this out! Wonderful tutorial. Your techniques, the face mapping, is new to me and looks like it will be a valuable tool as I attempt to paint faces. i absolutely love your tutorial, Pam……i’m a fan!!!! Faces are my favorite things to paint. You have inspired me to try something different (for me). I usually shy away from using just black/white/shades of gray, but I’m looking forward to giving this a try! Thank you! I really love your teaching style. Being a bit intimidated by faces, I like how you said it doesn’t have to look exact but some of me will shine through. Great tutorial and giveaway! Love your work and the grey tones are breathtaking! Great idea using just a part of yourself in the painting. It helps knowing practice is how to grow but trying to make it look just like yourself is very hard since that only comes with practice. You have eliminated the catch 22 and I have lots of things about my face that make it different (I don’t like) and they would be fun to add to a face for practice. Your book sounds wonderful. Pam, I loved your tutorial!! I took your and Mary Beth’s class in April at Ephemera in Paducah, KY. I was totally new to mixed media at that time. I have been working a lot in the art journal we started in that class. Your instructions have helped me so much. 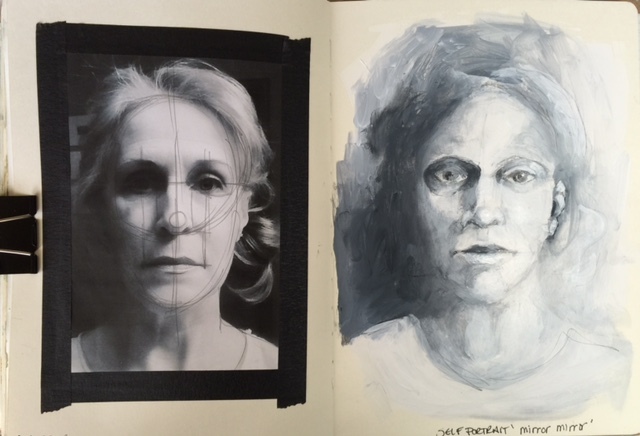 I love the tonal portraits you had in your art journals, and this tutorial helps even more!! You have a knack for making the complex simple. Your products are great, and I use them a lot!!! Thank you, Pam!!! Thanks so much for being the guest artist this week! Your work is beautiful and I love the simplicity of limited media. Really enjoyed your video and tutorial. Found them very helpful. Thank you so much for sharing. Wonderful tutorial! I will be sharing with my high school art students to encourage more confidence in their portrait drawing and journaling. Thank you so much for sharing. Don’t know where I have been but I was not familiar with your work and I should have been as I love doing faces……they look nothing like yours but as you say it takes practice… One day I want a wall like yours with all my faces framed and hung up…..loved the tutorial as there was so much information and knowledge……thanks so much….also I will try your paint as I live in AZ and paint drying to fast is always as issue…. Watching your tutorial opens up a world of possibilities. Do the same rules apply for guys? Love your style! I really enjoyed watching your video…makes this process look possible. Ready to give it a try in my own journal. Always a fan! What a detailed and fabulous tutorial on this subject. I’m sure many of us balk when trying to do faces. It’s great to give ourselves the freedom to capture some quality or essence without needing it to be a dead-ringer for the face we’re making art of. Thanks so much! I love your style of teaching because you are not only a great artist but you make us feel like , yes we can do this. Thankyou for sharing and for the chance to win. I love how you make creating a self-portrait seem possible for us newbies. You teach in a way that I get it! Thanks so much! Looking forward to seeing your new book. Art at the Speed of life is on my bedside table at the moment. Love your style! Looking forward to trying out your technique. Thanks for sharing and for the opportunity to win! Thank you for sharing. I love the tutorials. I love your art. Love the black and white scheme, this is something I’d rather do than go for “real” skin and shadow tones, especially since faces feel intimidating as they are. Cool and easy way to transfer the image, must try, thanks! Pam, I so love your style!!! Your drawings and paintings are so inspiring!!! Thank you for sharing your process with us. And thanks for a chance at winning one your books!!! Faces have always been a big challenge for me. You have made me believe I can do this. Thank you so much. Thank you for sharing your talent and making me believe that I can do this. I am fascinated by how easy you make this look, even though it appears complicated to me. Still, I am beginning to understand the science of it all. There is as a balance to it that I believe, as one follows the instruction without pondering the outcome, the outcome will be delightful! Brilliant thankyou. I get too wrapped up in thinking a selfie portrait should be perfect and true to life. I never thought to just add one small part of myself. Great advice. Your tutorial is awesome and very helpful. One of these days I may start to believe I am an artist. Thank you! Pam! 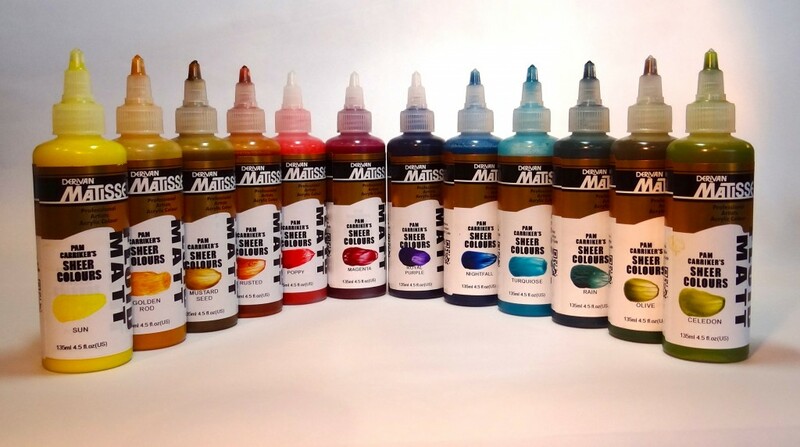 Your new Flow Matt paints & dvds are fabulous! What a terrific idea to “spiralize” the book. I’ve so enjoyed your two previous books & look forward to this new one on my favorite painting subject – portraits. A workshop in Texas would sure be great, but I’m so grateful for all the on-line classes and dvds. I am so excited to get started not his project Pam! This was extremely helpful. If I am not chosen to win a copy of your book, I think I’ll buy one! Thank you! So wonderful to see an idea that anyone with any art ability can try! Thanks! My HS Art class would love your book! What a fabulous tutorial..this I am going to do..im always so intent on getting it right or perfect.that i avoid doing portraits altogether..you made it seem intriguing and fun to make it more quirky..and that really is appealing..Thanks so much.. This tutorial makes faces feel actually possible instead of impossibly scarey! Thank you for sharing on the Documented Life! Thank you for sharing your process. 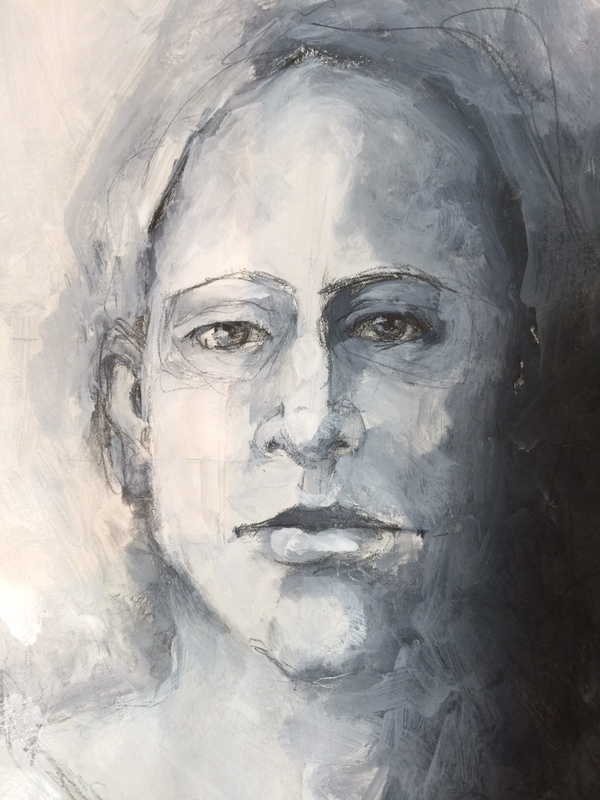 I will have to try this approach to monochrome portrait painting. Thank you for the opportunity to win your contest too. This is a wonderful tutorial. I really want to develop my ability to draw faces. You make doing a “self portrait” seem possible. Thank you! LOVE LOVE LOVE. AND YOUR BOOK IS ON MY WISHLIST!!! Thanks for sharing your talent. wow What a beautiful and stunning portrait and technique… I’ve definitely added your book to my wish list! Very much enjoy your work. I would love to have a copy of your book! Wow the process becomes simpler the way you explain it! Faces are so hard to draw. But your steps help. Thank you and thank you for a chance to win your book! I have your first book and absolutely love it. I would love to win your second book and continue on my journey of faces. Thanks for the opportunity!!! Can’t wait to try this! Thanks for sharing your beautiful art and techniques. Straight forward advice and user friendly technique to achieve stellar results. This new book looks very helpful. Fantastic! Enjoy watching you work. I will try this technique. And I would like to win your book. This looks like fun. Will need to try this, it would be great presents for people. So professionally done yet so teachable to someone like me. I so enjoy the learning process with Pam. Stunning work..cannot wait to dive in! Fingers crossed a push to start another art adventure!! Hi Pam, so glad you are guesting on The Documented Life Project. I’ve been working through their prompts all year…some very challenging, some right in my comfort zone and a few that didn’t fit me at the moment. I am so pleased for your success and the acknowledgement of other artists as the introduce you to their followers. I learn a lot by watching and trying. The video in DLP is much appreciated! I use you face mapping. 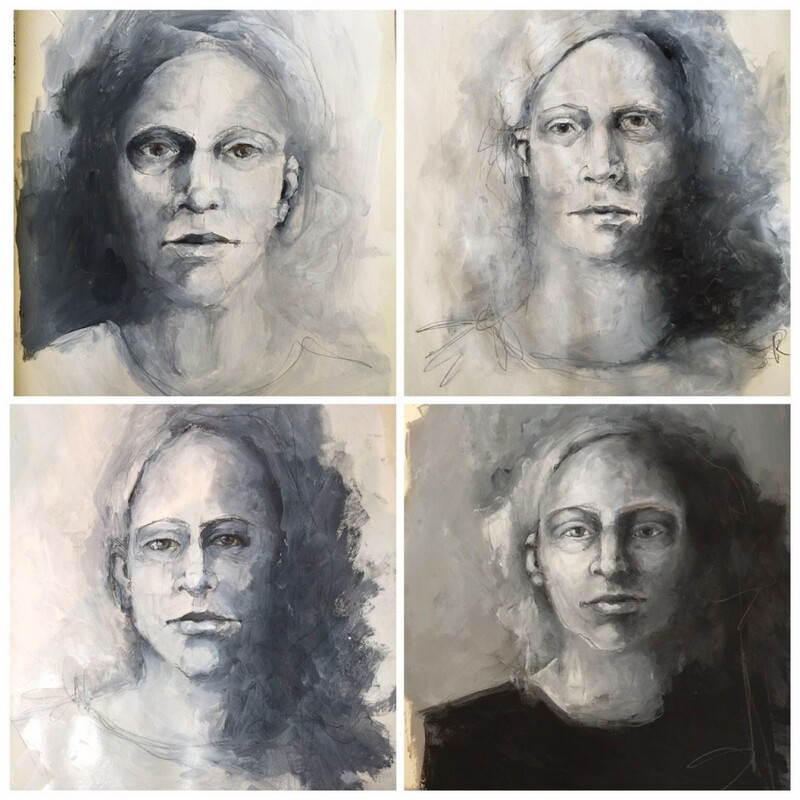 Face mapping has given me the tools to paint faces– something I have worked toward and see progress in. Thank you! What a wonderful and laid back tutorial. I appreciate your reminders that it does not have to be perfect, and we need to give the eye some interesting things to find. I was lucky enough to have been able to take two classes with you at Art Is You, and your online tutorials and books are nearly as easygoing yet informative as learning from you in person. Nothing quite takes the place of in-person, but you have definitely made your books and tutorials a close second. Thank you. Fantastic tutorial and video. You are a wonderful artist and teacher. I would be honored to own your book, it will be put to good use teaching me the many things I’m eager to learn. Thank you for this opportunity. Fascinating! Might have to give your technique a whirl asap. Thanks Pam! Love your style! Can’t wait to go watch the video and experiment your technique! Have been dying for one of your books! Wow!! Great tutorial as always!! Loved it …!! Love your idea of making the face interesting vs “pretty”. Always enjoy your classes and books- wish you were teaching at more venues again. Oh well. Would live a copy of the new book! Thanks for this great tutorial! Can’t wait to get started.